I've been searching for what feels like for ever for a good photoshop tutorial and I love this! Thank you so much!! I haven't drawn with a computer for ages, but I want to start again, but need to find my own techniques and style before I want to post anything... So thank you! I was just wondering if you remember what brush you used? I can't find one I feel comfortable with..
Hi! I was trying to download this tutorial but the link opens this same page.. so no tutorial. Personally I thought your pic looked best before you changed the color of the lineart- but I suppose it's more realistic your way since as in life we are not surrounded by a black line. Tutorial was awesome though. The second last step, "hiding" the lines isn't working for me. Though I colour them, they are still clearly visible. sorry where is the toturial? exactly where is that :L ? 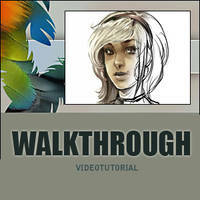 This is absolutely the best tutorial ever! I've never seen something so simple and useful! Thanks, I was looking for something like this! Good! Very useful I hope. Thank you. These are some of the most useful tutorials ever. Thank you! This is the clearest tut I've seen so far. Good job! !